Projects operate outside the usual range of functions of a business and are generally one time events. Projects have three constraints: Results, Budget and Time. For a project to be successful it must achieve the desired results, be completed within budget and be completed on time. The size, scope and complexity of a project dictates how a project will be managed. Not all projects should be managed using the same templates, forms and processes. It is easy to overwhelm a project manager with meetings and paperwork to the point where their project is doomed to failure before it even starts. Use the components of the project management process that will drive a project to a successful conclusion. Concept: Organizations often have too many projects and too little time to implement them. A process is needed to evaluate each project and determine if that project warrants the commitment of resources (both people and money). This evaluation takes place in the concept phase of a project. During the concept phase the project manager presents a high level overview of the project. This information will be evaluated and a determination is made on whether to pursue the project. Many projects never make it out of the concept phase. Planning: During the planning phase the cross-functional planning team is identified and the project is officially started. 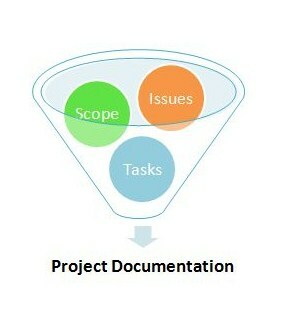 The project scope is defined and a project plan is created identifying tasks, resources and a timeline. Third party vendors, if needed, are identified in this phase. Implementation: The project plan is executed during this phase. Issues are identified and resolved, system test plans are developed and implemented, training needs are outlined, etc. Communication between the project team and project stakeholders is critical during this phase. Closeout: Project deliverables are transferred to the customer (either internal or external). At this time lessons learned are captured, successes and failures recognized, project documentation is archived and the project team is released. I was a Senior Vice President over Strategic Planning at Prudential Bank when I was asked to build a Project Management Office. My first task was to develop a project management process. I spent a week reviewing the Prudential Financial Project Management process as well as the project management process of a number of different organizations. I quickly realized that an organization of several hundred employees would not be able to support a complex and paper intensive process. I developed an effective simplified project management process and the associated project management forms. The process resulted in a reduction in the number of projects pursued, a more effective use of limited resources and a high success rate of completed projects. Are you ready to get started on developing your Project Management Templates and Forms? An initial consultation is only $100. Here is what you get. The $100 fee is applied to the cost of developing your Project Management Templates and Forms if you decide to use Jackie Willey. Jackie Willey is available for a free 30 minute consultation to discuss developing your Project Management Templates Forms and help you develop the best strategy to meet your needs.